Depicting the use of the Data Value Map, this article looks at a project in media broadcasting/production in Raidió Teilifís Éireann (RTÉ) Ireland’s national public-service media organisation in the hands of Nick Johnson the in-house Solutions Architect. 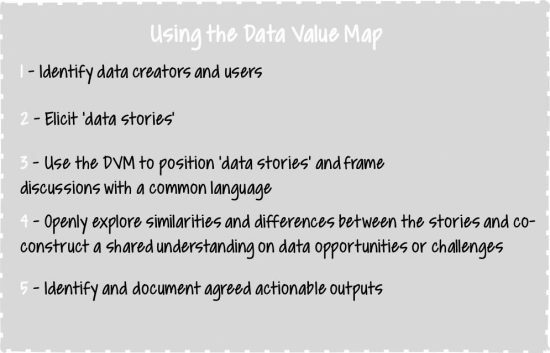 It highlights the power of the Data Value Map in supporting a human-centered approach for translating a data strategy from visionary programmes into well-grounded and effective projects that unlock the value from data. One key to unlocking value from data is developing a shared understanding of the data problems that people have in their day-to-day working lives. A founding member of RTÉ’s Data Value Group (a cross section of data creators and data users across the organisation as part of RTÉ’s data strategy), Nick developed such a shared understanding by leveraging the Data Value Map within the group and generating meaningful conversations. These conversations were open to challenging embedded assumptions of how the organisation operates, untangling the messiness of reality, and tracing symptoms to root causes. Ultimately providing a solid foundation to exploit data as an asset. Underpinning RTE’s data strategy is the complex landscape of media production and its associated measurement, with each platform – radio, television, outdoor (e.g. posters), print, online, and cinema being measured in different ways using different systems and in some cases, different standards. This is largely due to the relative maturity of the media themselves, as well as the concomitant development of the advertising markets that specialise in each type. Of particular importance for Nick and RTÉ is the Sagacity project that has the strategic aim of creating a 360 degree view of customers and their interactions with RTÉ’s services, which in turn will lead to a wide range of data capabilities from microscopic (individual customer tastes) to macroscopic (audience consumption) analysis. In addition, it will also enable data functions such as: personal recommendations, audience patterns, and revenue maximisation from advertising. Pre-dating the Sagacity project, a Data Value Group was created as part of RTÉ’s overall data strategy and involved a cross section of data creators and data users. Through this group the DVM was utilised as a key collaborative tool and conversation starter to help translate the organisations data strategy and shape the vision of projects such as Sagacity. In the early stages of Sagacity, a Data Value Group workshop was facilitated by Nick to identify starting points or sub-projects. Rather than focusing on the strategic objective of the project, the workshop took a bottom-up approach and essentially asked the participants what was important to them and what their pain points were. Each of the comments was positioned in a relevant segment of the DVM providing context and a basis for linking to other contributions in the group. Indeed, clusters of comments formed across the DVM which again provided a basis for further discussion and prompted further exploration for commonality, root causes and areas of potential improvement. The result of the discussions identified: cross-sectional analysis, business focused reports and searchable content as key areas ripe for improvement. Interestingly, the discussion also unearthed a choke point to the improvements and a critical step in unlocking their benefits. The key was ensuring that acquired data/content was tagged in a consistent and reliable fashion across the organisation. The main reason for inconsistent tagging was down to the idiosyncratic process of tagging, which was done from the specific context and perspective of each tagger. In fact, the exploration highlighted that some taggers did not realise they were both a data creator and data user, being the primary consumers of their own tagged content. A common pattern that surfaces in many workshops and organisations, in this case it described media producers tagging their own content only to experience that after six months it was very difficult to even locate not to mind leverage the tagged content (a situation I’m sure everyone can relate to). If tagging was consistent and was clearly understood by all in an organisational sense, it would open up a wealth of opportunities. Not only would analytics and marketing benefit – for example the performance of content segmented by key indicators would be easily derived regardless of platform, type or channel (and linked to properly tagged promotional activity), but so too would production and operations; consistently tagged content would simplify rights management, financial reporting and regulatory reporting and planning. The pain-point may seem overly simplistic (for its impact) and something that any logically planned project should include. However, it’s worth noting that it’s not primarily a tech problem (or fix) but a behavioural one. While, technology can be a guide to good behaviour, if people aren’t aware of their behaviour in the first place it may never change. 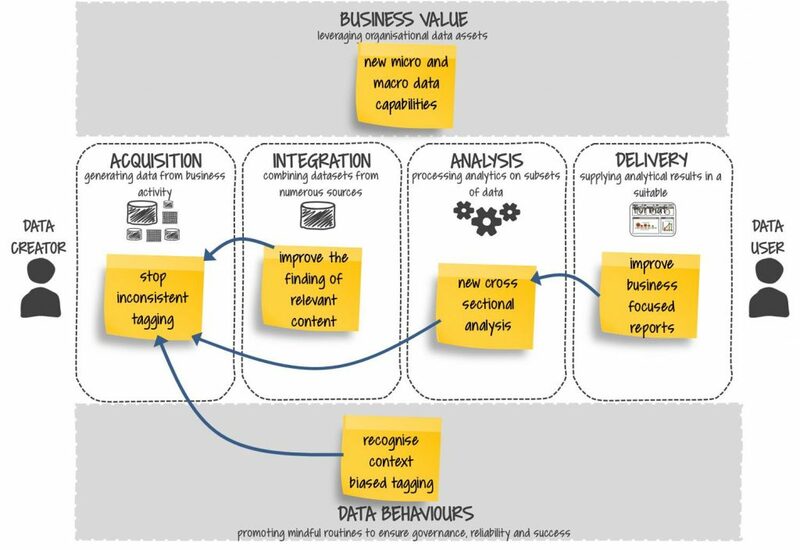 The power of the Data Value Map is that it enables an open discussion on data and allows issues/opportunities to be identified and untangled from incumbent business processes and technologies, the real key to unlocking the value of data. This particularly applies to behavioural issues that essentially determine the success or failure of a data initiative, which are at best misdiagnosed and at worst ignored.